Taking aspirin regularly for over 10 years does reduce the risk of bowel cancer, a study which looked at almost 83,000 women has suggested. Those who had taken two or more aspirin - or similar painkillers - a week had significantly cut their risk, it found. However, the doses were high enough to increase the risk of gut bleeds. The Harvard Medical School team told the Journal of the American Medical Association more work was needed to see if the benefits outweighed the risks. Regular aspirin use was already known to cut the risk of recurrent benign bowel tumours, called colorectal adenomas, in patients with a history of bowel tumours, either cancerous or benign. The Harvard team focused on 82,911 women of which 962 developed bowel cancer over a 20-year period. Among women who regularly used aspirin - or other non-steroidal anti-inflammatory drugs (NSAIDs) - there was a 23% reduced relative risk of bowel cancer compared with those who did not take the drugs regularly. However, significant risk reduction was not observed until more than 10 years of use. The benefit appeared to be related to dose - the biggest benefit at higher doses. A similar dose-response relationship was found for non-aspirin NSAIDs. 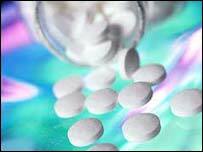 The researchers, led by Dr Andrew Chan, said: "Our study supports a possible role for aspirin in cancer prevention. "However, any substantial impact of aspirin on cancer necessitates early initiation and prolonged, consistent use. "Moreover, optimal chemoprevention may require substantially higher doses of aspirin than currently recommended for the prevention of cardiovascular disease." The researchers stressed that taking aspirin in higher doses was associated with side effects, such as gastrointestinal bleeding. They said more work was needed to determine whether the benefits of taking the drug outweighed the risk. Ed Yong, of Cancer Research UK, agreed. He said: "High doses of aspirin are needed to reduce bowel cancer risk, and these could cause bleeding in the digestive system. "Future studies need to weigh up all of the risks and benefits of high doses of aspirin before recommendations can be made. "Besides taking aspirin, there are many other ways of reducing the risk of bowel cancer such as keeping a healthy bodyweight, being active and eating lots of fibre and fish and less red or processed meat."